There's lot's to tell about spareribs. There are different styles and tastes of spareribs and numerous ways to prepare them. There's loin ribs and belly ribs. When an American says spareribs he means belly ribs. These are actually the true ribs. The ribs in Dutch shops and butchers are "baby back ribs" or loin ribs. They are cut from the loin against the spine. The beauty of baby backs is that they are handy, tender and pretty quick to prepare. Belly ribs of St. Louis Ribs Spareribs are cut from the lower part, against the abdomen. They have firmer flesh and are much larger. However, abdominal ribs contain much more flavor. It takes more time to prepare but the taste is fantastic. Spareribs are incredibly popular. Spare ribs are inexpensive and always a feast to prepare and to eat. Spareribs are suitable to cook within one hour, but a true lover can take four, five hours time to cook them. If you cook ribs at a lower temperature you keep the juices and that leaves the meat more tender. At higher temperatures, you reach the core temperature of at least 75 degrees faster but you lose a little more moisture. That is important because at 70 degrees at the so-called collagen melts. Collagen is the substance that attaches teh meat to the bone. It provides strength and rigidity, but at 70 degrees turns it into a tender elastin. You can choose from different pig breeds. Dutch spare ribs come from the landrace and are relatively neutral in flavor, but Spanish Iberico ribs include more intense flavor. Iberico ribsare unsuitable for over-seasoning or heavy marinating. And there's the tasty pork breeds. Often crosses of original varieties, and through a rich diet and natural environment they provide more creaminess and flavor tones than landrace pigs. Examples of such pigs are Yorkshire White, Livar and Duke of Berkshire. You can do anything to spice things up ribs. The simplest method is to use a dry rub ", a blend of spices added to the meat at preparation. The taste blends slowly into the ribs and give a nice flavor. You can also choose to marinate. One night before preparation, rest the spareibs in a bowl or a resealable plastic bag with the liquid marinade blend. Another method is "basting" or "glazing". 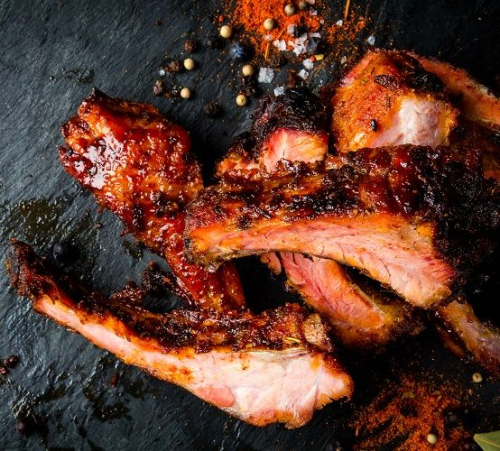 Bastings means to constantly rub the ribs with a glaze, a spicy mix and liquid. Often contains a mixture of balsamic vinegar-like element. The vinegar acts as a tenderizer of the meat during cooking. Finally, the hardest: When are the ribs done? Your target temperature is about 75 to 80 degrees Celsius, but a core thermometer will not do much good. You can use the bending test: The ribs are done when the string breaks when you bend it. It does not break in half, but almost. If you see a small crack; the ribs are not ready yet. 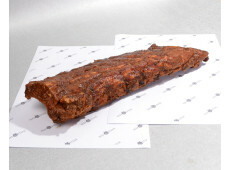 Baby Back Spareribs (Box 10 kg) .